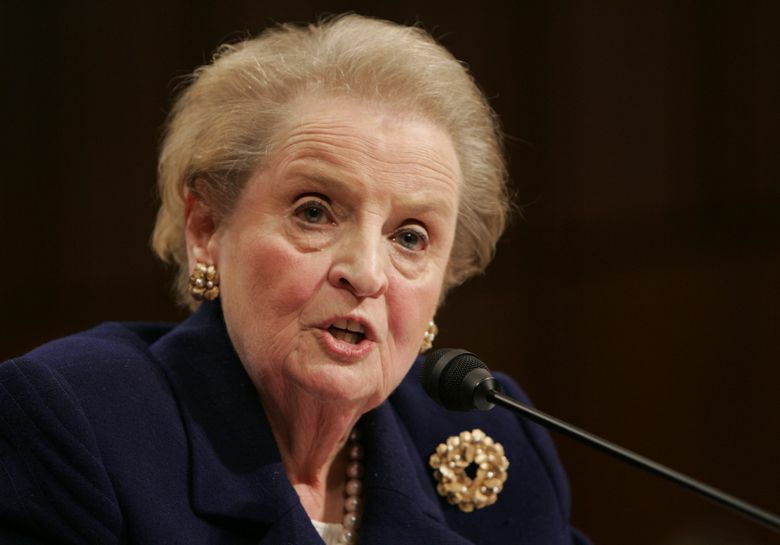 Remember when newly minted Secretary of State Madeleine Albright made headlines with a decidedly “unladylike” reference after Cuban pilots had bragged they shot down unarmed civilian planes? “Frankly, this is not cajones. This is cowardice,” she said, provoking gasping headlines. Her pronouncement in 1996 publicly signaled that the first woman in that job was as tough-talking as any of the 63 men who preceded her. She went on to stand toe to toe with world leaders, often as the only woman in the room. Through June 7, the Bellevue Arts Museum is hosting an exhibit of pins former Secretary Albright wore in her diplomatic work. Always, she was feminine, famously using jewelry as a diplomatic tool to send messages to friend and foe, alike. At Bellevue City Hall Wednesday to discuss the exhibit of her 200 pins, she recounted how this began. As U.S. Ambassador to the United Nations in 1994, she criticized Saddam Hussein for breaking a key agreement. An Iraqi poet responded, calling her “an unparalleled serpent.” At her next meeting with Iraqi officials, she pinned a snake brooch to her lapel. When queried, she said she was sending a message. Dove pins signaled a wish for peace; a crab pin suggested lateral movement. As secretary, Albright was pointed and assertive. I remember an NPR story where a parenting expert appraised her diplomatic style as fair and firm, like a mother with high expectations. The Bellevue Arts Museum exhibit is called “Read My Pins,” but clearly Albright’s opinions are rarely that cryptic.